Claudius Ptolemy lived and worked in the city of Alexandria, capital of the Roman province of Egypt, during the reigns of the later Flavian and the Antonine emperors. Ptolemy was heir--via the writings of Euclid, and later mathematicians such as Apollonius of Perga, and Archimedes of Syracuse--to the considerable mathematical knowledge of geometry and arithmetic acquired by the civilization of Ancient Greece. Ptolemy also inherited an extensive Ancient Greek tradition of observational and theoretical astronomy. The most important astronomer prior to Ptolemy was undoubtedly Hipparchus of Nicaea (second century BCE), who developed the theory of solar motion used by Ptolemy, discovered the precession of the equinoxes, and collected an extensive set of astronomical observations--some of which he made himself, and some of which dated back to Babylonian times--which were available to Ptolemy (probably via the famous Library of Alexandria). Other astronomers who made significant contributions prior to Ptolemy include Meton of Athens (5th century BCE), Eudoxos of Cnidus (5th/4th century BCE), Callipus of Cyzicus (4th century BCE), Aristarchus of Samos (4th/3rd century BCE), Eratosthenes of Cyrene (3rd/2nd century BCE), and Menelaus of Alexandria (1st century CE). Ptolemy's aim in the Almagest is to construct a kinematic model of the solar system, as seen from the earth. In other words, the Almagest outlines a relatively simple geometric model which describes the apparent motions of the sun, moon, and planets, relative to the earth, but does not attempt to explain why these motions occur (in this respect, the models of Copernicus and Kepler are similar). As such, the fact that the model described in the Almagest is geocentric in nature is a non-issue, since the earth is stationary in its own frame of reference. This is not to say that the heliocentric hypothesis is without advantages. As we shall see, the assumption of heliocentricity allowed Copernicus to determine, for the first time, the ratios of the mean radii of the various planets in the solar system. We now know, from the work of Kepler, that planetary orbits are actually ellipses which are confocal with the sun. Such orbits possess two main properties. First, they are eccentric: i.e., the sun is displaced from the geometric center of the orbit. Second, they are elliptical: i.e., the orbit is elongated along a particular axis. Now, Keplerian orbits are characterized by a quantity, , called the eccentricity, which measures their deviation from circularity. It is easily demonstrated that the eccentricity of a Keplerian orbit scales as , whereas the corresponding degree of elongation scales as . Since the orbits of the visible planets in the solar system all possess relatively small values of (i.e., ), it follows that, to an excellent approximation, these orbits can be represented as eccentric circles: i.e., circles which are not quite concentric with the sun. In other words, we can neglect the ellipticities of planetary orbits compared to their eccentricities. This is exactly what Ptolemy does in the Almagest. It follows that Ptolemy's assumption that heavenly bodies move in circles is actually one of the main strengths of his model, rather than being the main weakness, as is commonly supposed. Kepler's second law of planetary motion states that the radius vector connecting a planet to the sun sweeps out equal areas in equal time intervals. In the approximation in which planetary orbits are represented as eccentric circles, this law implies that a typical planet revolves around the sun at a non-uniform rate. However, it is easily demonstrated that the non-uniform rotation of the radius vector connecting the planet to the sun implies a uniform rotation of the radius vector connecting the planet to the so-called equant: i.e., the point directly opposite the sun relative to the geometric center of the orbit--see Fig. 1. Ptolemy discovered the equant scheme empirically, and used it to control the non-uniform rotation of the planets in his model. In fact, this discovery is one of Ptolemy's main claims to fame. Ptolemy is often accused of slavish adherence to the tenants of Aristotelian philosophy, to the overall detriment of his model. However, despite Ptolemy's conventional geocentrism, his model of the solar system deviates from orthodox Aristotelism in a number of crucially important respects. First of all, Aristotle argued--from a purely philosophical standpoint--that heavenly bodies should move in single uniform circles. However, in the Ptolemaic system, the motion of the planets is a combination of two circular motions. Moreover, at least one of these motions is non-uniform. Secondly, Aristotle also argued--again from purely philosophical grounds--that the earth is located at the exact center of the universe, about which all heavenly bodies orbit in concentric circles. However, in the Ptolemaic system, the earth is slightly displaced from the center of the universe. Indeed, there is no unique center of the universe, since the circular orbit of the sun and the circular planetary deferents all have slightly different geometric centers, none of which coincide with the earth. As described in the Almagest, the non-orthodox (from the point of view of Aristolelian philosophy) aspects of Ptolemy's model were ultimately dictated by observations. This suggests that, although Ptolemy's world-view was based on Aristolelian philosophy, he did not hesitate to deviate from this standpoint when required to by observational data. From our heliocentric point of view, it is easily appreciated that the epicycles of the superior planets (i.e., the planets further from the sun than the earth) in Ptolemy's model actually represent the earth's orbit around the sun, whereas the deferents represent the planets' orbits around the sun--see Fig. 29. It follows that the epicycles of the superior planets should all be the same size (i.e., the size of the earth's orbit), and that the radius vectors connecting the centers of the epicycles to the planets should always all point in the same direction as the vector connecting the earth to the sun. We can also appreciate that the deferents of the inferior planets (i.e., the planets closer to the sun than the earth) in Ptolemy's model actually represent the earth's orbit around the sun, whereas the epicycles represent the planets' orbits around the sun--see Fig. 33. It follows that the deferents of the inferior planets should all be the same size (i.e., the size of the earth's orbit), and that the centers of the epicycles (relative to the earth) should all correspond to the position of the sun (relative to the earth). Figure 1: Hipparchus' (and Ptolemy's) model of the sun's apparent orbit about the earth (right) compared to the optimal model (left). 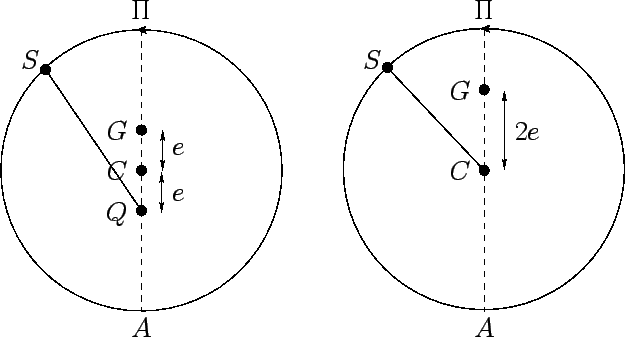 The radius vectors in both models rotate uniformly. Here, is the sun, the earth, the geometric center of the orbit, the equant, the perigee, and the apogee. The radius of the orbit is normalized to unity. The geocentric model of the solar system outlined above represents a perfected version of Ptolemy's model, constructed with a knowledge of the true motions of the planets around the sun. Not surprisingly, the model actually described in the Almagest deviates somewhat from this ideal form. In the following, we shall refer to these deviations as ``errors'', but this should not be understood in a perjorative sense. Ptolemy's next error was to neglect the non-uniform rotation of the superior planets on their epicycles. This is equivalent to neglecting the orbital eccentricity of the earth (recall that the epicycles of the superior planets actually represent the earth's orbit) compared to those of the superior planets. It turns out that this is a fairly good approximation, since the superior planets all have significantly greater orbital eccentricities than the earth. Nevertheless, neglecting the non-uniform rotation of the superior planets on their epicycles has the unfortunate effect of obscuring the tight coupling between the apparent motions of these planets, and that of the sun. The radius vectors connecting the epicycle centers of the superior planets to the planets themselves should always all point exactly in the same direction as that of the sun relative to the earth. When the aforementioned non-uniform rotation is neglected, the radius vectors instead point in the direction of the mean sun relative to the earth. The mean sun is a fictitious body which has the same apparent orbit around the earth as the real sun, but which circles the earth at a uniform rate. The mean sun only coincides with the real sun twice a year. Ptolemy's third error is associated with his treatment of the inferior planets. As we have seen, in going from the superior to the inferior planets, deferents and epicycles effectively swap roles. For instance, it is the deferents of the inferior planets, rather than the epicycles, which represent the earth's orbit. Hence, for the sake of consistency with his treatment of the superior planets, Ptolemy should have neglected the non-uniform rotation of the epicycle centers around the deferents of the inferior planets, and retained the non-uniform rotation of the planets themselves around the epicycle centers. Instead, he did exactly the opposite. This is equivalent to neglecting the inferior planets' orbital eccentricities relative to that of the earth. It follows that this approximation only works when an inferior planet has a significantly smaller orbital eccentricity than that of the earth. It turns out that this is indeed the case for Venus, which has the smallest eccentricity of any planet in the solar system. Thus, Ptolemy was able to successfully account for the apparent motion of Venus. Mercury, on the other hand, has a much larger orbital eccentricity than the earth. Moreover, it is particularly difficult to obtain good naked-eye positional data for Mercury, since this planet always appears very close to the sun in the sky. Consequently, Ptolemy's Mercury data was highly inaccurate. Not surprisingly, then, Ptolemy was not able to account for the apparent motion of Mercury using his standard deferent-epicycle approach. Instead, in order to fit the data, he was forced to introduce an additional, and quite spurious, epicycle into his model of Mercury's orbit. Ptolemy's fourth, and possibly largest, error is associated with his treatment of the moon. It should be noted that the moon's motion around the earth is extremely complicated in nature, and was not fully understood until the early 20th century CE. Ptolemy constructed an ingenious geometric model of the moon's orbit which was capable of predicting the lunar ecliptic longitude to reasonable accuracy. Unfortunately, this model necessitates a monthly variation in the earth-moon distance by a factor of about two, which implies a similarly large variation in the moon's angular diameter. However, the observed variation in the moon's diameter is much smaller than this. Hence, Ptolemy's model is not even approximately correct. Ptolemy's fifth error is associated with his treatment of planetary ecliptic latitudes. Given that the deferents and epicycles of the superior planets represent the orbits of the planets themselves around the sun, and the sun's apparent orbit around the earth, respectively, it follows that one should take the slight inclination of planetary orbits to the ecliptic plane (i.e., the plane of the sun's apparent orbit) into account by tilting the deferents of superior planets, whilst keeping their epicycles parallel to the ecliptic. Similarly, given that the epicycles and deferents of inferior planets represent the orbits of the planets themselves around the sun, and the sun's apparent orbit around the earth, respectively, one should tilt the epicycles of inferior planets, whilst keeping their deferents parallel to the ecliptic. Finally, since the inclination of planetary orbits are all essentially constant in time, the inclinations of the epicycles and deferents should also be constant. Unfortunately, when Ptolemy constructed his theory of planetary latitudes he tilted the both deferents and epicyles of all the planets. Even worse, he allowed the inclinations of the epicycles to the ecliptic plane to vary in time. The net result is a theory which is far more complicated than is necessary. The final failing in Ptolemy's model of the solar system lies in its scale invariance. Using angular position data alone, Ptolemy was able to determine the ratio of the epicycle radius to that of the deferent for each planet, but was not able to determine the relative sizes of the deferents of different planets. In order to break this scale invariance it is necessary to make an additional assumption--i.e., that the earth orbits the sun. This brings us to Copernicus.